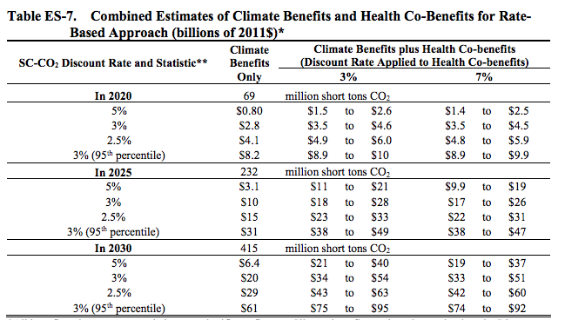 In the climate change policy debate, the latest news is the carbon tax bill (H.R. 6463) introduced by Florida Republican Rep. Carlos Curbelo, which would levy an initial $24 per ton tax on carbon in the year 2020, and would rise 2% (plus inflation) annually thereafter. The episode underscores the warnings I have been giving conservatives and libertarians over the years, who are being courted to support an ostensibly “pro-growth” carbon tax deal. For example, the Curbelo bill doesn’t even pretend to be revenue neutral; it literally establishes a new “trust fund” to spend hundreds of billions of dollars on infrastructure and other projects. Moreover, even on its own terms, the Curbelo proposal doesn’t solve the ostensible climate change problem—as critics on the left have already pointed out. As a post on our sister website explains, neutral analyses confirm that the Curbelo bill would raise energy prices for Americans while doing little to slow global emissions. There are also dubious provisions in this specific bill (such as contingencies for higher tax rates), which I will document below. Conservatives and libertarians should be wary of tax hikes on energy in order to expand government spending, even if they have “Market Choice” in the title. On the face of it, this is absurd. The bill contains specific tax rates by year for carbon dioxide emissions, but it also contains specific targets of emissions by year (as I will explain below). Furthermore, most of the revenue will not be returned to citizens via dividends or other tax reductions, but instead will be spent through the political process. There are lots of ways to accurately describe a central plan from Washington, D.C., that sets a schedule for national emissions, establishes a “National Climate Commission” (! ), and raises taxes some $60 billion in the first year alone…but “Market Choice Act” isn’t one of them. The fundamental problem here is that the people who are most concerned about the dangers of climate change believe only draconian measures will solve the ostensible problem. Therefore, in their minds any carbon tax that is remotely politically feasible will not be an answer. And so we see that at least as far as Vox’s featured climate policy expert is concerned, even a $73 per ton carbon tax would fail to achieve a reduction target that itself is “woefully insufficient.” This is why Roberts never agreed with the idea of enacting a carbon tax and getting rid of other regulations (which is the bait offered to libertarians and conservatives), even in principle. Roberts has consistently maintained over the years that a “market solution” like a carbon tax at best should supplement other government initiatives, including direct regulations and heavy investment in alternative technologies. ‘‘(i) The total emissions through calendar year 2020 are 5,177 million metric tons of carbon dioxide equivalent. The “every second calendar year” clause is confusing, but since the bill gives emissions targets for each year, it seems that it allows for a $2 per ton hike annually; that is how others have interpreted it. 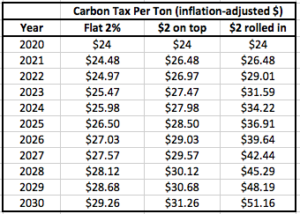 In the table above, the first column (“Flat 2%”) shows what happens if the initial $24 per ton Curbelo tax grows at a real (i.e. inflation-adjusted) 2% rate per year. 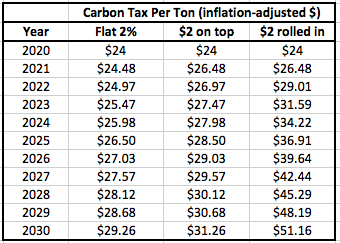 In the second column (“$2 on top”), I’ve simply added $2 to the values in the first column, showing what happens if the extra $2 penalty because of emissions is merely tacked onto the baseline schedule. However, in the last column, I show what theoretically could be the fastest growth of the Curbelo tax, if we assume each year the tax rate is calculated by increasing the previous year’s rate by 2% and then adding an additional $2. Under this interpretation, we see that if the economy’s emissions should miss the target every year, then the initial $24 per ton tax could exceed $51 by 2030—and remember, here we aren’t even factoring in price inflation. The actual dollar figure of the tax would be higher still in 2030, because of the weakening dollar. These potential federal carbon tax rates are even more onerous when we consider that they would eventually supplement state-level carbon taxes. Section 9905 of the Curbelo bill grants federal tax credits for state-based payments, but these phase out at the rate of 20 percentage points per year, so that by the fifth year following enactment, a taxed entity will be responsible both for the full carbon-tax liability under federal law, plus whatever the entity may owe in state-level taxes and fees. Perhaps a Trump Administration would interpret this clause in the commonsense fashion, meaning that all regulations on greenhouse gas emissions emanating from the Clean Air Act would be suspended, since the whole point of a carbon tax is to “internalize the externality” and substitute a “market system” in place of top-down command-and-control. The point is, even on its own terms, the Curbelo bill wouldn’t knock out something like the Clean Power Plan. Future Administrations could plausibly continue with its enforcement, arguing that the co-benefits alone justified the measures. Besides the above concerns, there are other elements in the Curbelo bill that should alarm skeptics of federal overreach, such as provisions to allow officials to add products and even entire industries to the list of taxed entities, so long as certain emissions criteria are met. There is also an entire section on the creation of a “National Climate Commission,” which hardly smacks of limited government. For years now, conservatives and libertarians have been told they should support a compromise carbon tax, in exchange for offsetting tax cuts and elimination of inefficient top-down climate regulations. The Curbelo plan fails on both counts: it proudly announces that it will use the revenues to expand government spending, and it has huge loopholes to allow existing regulations to remain in force, on top of the new carbon tax. Conservatives and libertarians should consider the Curbelo bill with eyes wide open. To add insult to injury, it doesn’t even address the ostensible climate change problem, which is why it has harsh critics on the Left as well.